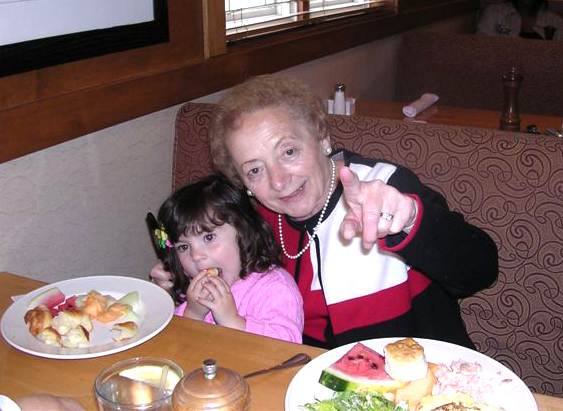 Ninety years of life for my mom – almost a century of experiences. One can only imagine what that must feel like. Of course it seems like every time I turn around, we are all attempting to turn the clock back and outlive time. But why not just live? Mom’s (Vincenzella “Jean” Giuliani, aka Vinnie as we would jokingly call her) life was simple. A descendant of Italian immigrants, her father died before she could know him. My mom’s stepfather and half brother embraced her as their own, yet a piece of her heart was always missing. Growing up she understood what it was like to go without, suffering through the Great Depression. And as a result of her heritage, she was no stranger to forms of bullying. A lover of children, Mom eventually becoming a teacher before marrying my father. With five children of her own (six if you count her first born that died two days after birth), she was like a circus clown always juggling our schedules and personalities. My mother expressed her love language through food – EVERYTHING was homemade. A joyful tune from Frank Sinatra always rendered a smile, while a half hour spent watching M*A*S*H or Everybody Loves Raymond exposed her distinct laugh. A card game or two revealed her competitive side, yet the pinching of her grandchildren’s cheeks displayed her compassion. Technology was foreign to Mom…ultimately blessed as a result. She lived for the moment instead – present at every social event, school play, softball game, cheerleading competition, track meet, basketball game, girl/boy scout ceremony, graduation, family gathering, birth of a grandchild, wedding, and every trial and tribulation of each child. Mom went wherever the need was, providing unwavered strength when we were searching for ours. You see, my friend, we often are too consumed with life to ‘just be’. Overwhelmed by the hustle, we keep doing and going and struggling and maneuvering and pushing and pulling and…URRRRRR!!!!! We forget too easily to ‘be’. So in honor of my mom, I encourage you to stop doing and start being. Your self-worth is not measured by how busy you are, what you’ve achieved or how much money is in the bank. Walk in purpose, be intentional, live for moments. There is no medal of worthiness that we are adorned with at some ceremony. The only worthiness is what you feel in your heart. Thank you for following my journey! It has reached a point where it can grow into so much more, and I would be so grateful to receive your support over the next 8 days as I’ve been nominated to earn Ms. Health and Fitness! Earning this title and reward could lay the foundation of where I’ve been putting a lot of energy recently – equipping teens with more emotional intelligence tools to better handle the complexities of life that they continue to get exposure to at younger and younger ages. If you believe in this mission, and me, I invite you to vote for me each day for the next 8 days!